The film follows Chávez’s efforts to organize 50,000 farm workers in California, some of whom were braceros—temporary workers from Mexico permitted to live and work in the United States in agriculture, and required to return to Mexico if they stopped working. Working conditions are very poor for the braceros, who also suffer from racism and brutality at the hands of the employers and local Californians. To help the workers, César Chávez (Michael Peña) forms a labor union known as the United Farm Workers (UFW). Chávez’s efforts are opposed, sometimes violently, by the owners of the large industrial farms where the braceros work. The film touches on several major nonviolent campaigns by the UFW: the Delano grape strike, the Salad Bowl strike, and the 1975 Modesto march. When World War II broke out, reporter Martha Gellhorn was so determined to get to the frontlines that she left husband Ernest Hemingway, never to be reunited. Ruth Cowan’s reporting was hampered by a bureau chief who refused to talk to her. Meanwhile, photojournalist Dickey Chappelle wanted to get so close to the action that she could feel bullets whizzing by. 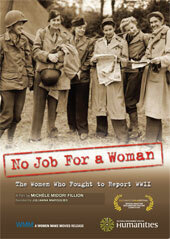 This award-winning documentary tells the colorful story of how these three tenacious war correspondents forged their now legendary reputations during the war—when battlefields were considered no place for a woman. Narrated by Emmy® Award winner Julianna Margulies, this film features an abundance of archival photos and interviews with modern female war correspondents, as well as actresses bringing to life the written words of these remarkable women. Their repeated delegation to the sidelines to cover the “woman’s angle” succeeded in expanding the focus of war coverage to bring home a new kind of story— a personal look at the human cost of war. Synopsis: Story of Medina, who became UFCW VP and then SEIU VP, leading movement to organize immigrant workers and fight for immigration reform. Synopsis: William C. Blizzard, the son of Bill Blizzard, the “general” of the Battle of Blair Mountain, with the assistance of Wess Harris, compiled his many accounts of the West Virginia Mine Wars in his book, “When Miners March.” He had written most of the book for various labor publications anonymously in the 1950s. In 2005 Ross Ballard took the book and turned it into a monumental “audio movie,” complete with sound effects and original music. Songs on the special CD are by T. Paige Dalporto, Elaine Purkey, Hazel Dickens, Mike Morningstar, John Lilly and the Irish duo of Enda Cullen and Ian Smith.